In reflecting on “then and now,” my journey has gone from 35 plus years in education to 21 years in health. At the end of 2012, in concluding full-time roles since profession in 1964, the last being at Outreach, it was decided I would cut back to part-time ministry. 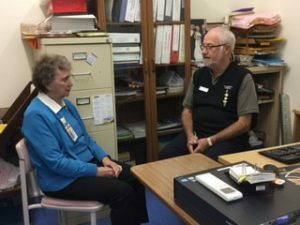 My new role was negotiated with the Manager Sub Acute & Allied Health, St Vincent’s Health Network, to support the mission, values, and vision of SVHA by being a Sister of Charity presence, initially at St Joseph’s Hospital, Auburn. The role was two to three days a week, with flexibility, enabling attendance at special celebrations. 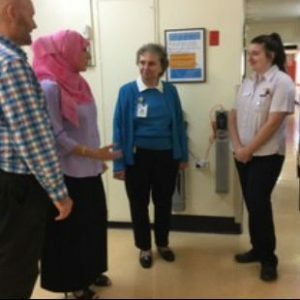 During 2014, I was also asked if I would take on a similar role at the Mater Private Hospital, North Sydney, one day a week, which happened in 2015. I soon discovered these are two very different hospitals. Firstly, St Joseph’s, a public hospital, founded by the Sisters of Charity in 1886, when the Sisters established a “consumptive” hospital at Parramatta, as a branch of St Vincent’s. Six years later it was transferred to Auburn. The Mater was founded by the Sisters of Mercy North Sydney, in 1906, with its own history, culture, and heritage. In 2001, the Mater Hospital became part of St Vincent’s & Mater Health Sydney, which today sits under St Vincent’s Health Australia, founded by the Sisters of Charity, now under the direction of Mary Aikenhead Ministries. This was not only a new role within both hospitals, but, for me, as well. At St Joseph’s I was formally introduced at the staff forum, followed by a tour of the departments. At the Mater, I was welcomed by the Sisters of Mercy Congregational Leader & Council at an afternoon tea with the hospital executive. The first challenge I encountered was that I had time whereas staff members were very busily involved in their work. Maybe I was a threat to some, who were wondering why I was there. I soon realised I needed to go gently, walk the corridors, smile, in order to build rapport, trust, and relationships with staff at all levels. Being a Sister of Charity, it has been important for me to get to know the Sisters of Mercy, who attend Mass there, to respect and understand their story, history, and heritage, as well as to work with the Mission Integration Manager to share the story, history and heritage of Mary Aikenhead, and our first five Sisters. In both hospitals I’ve participated in meetings, functions, workshops, “missionings,” feast days, pilgrimages, and planning days etc. No two days are the same. Over time, through being a listening presence, trust and confidence have developed.